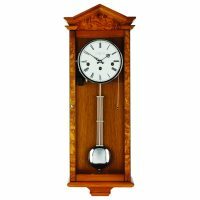 Oak and Olive 8 day Comitti Westminster chime Wall regulator clock C3871CH - Connard & Son Ltd. Solid oak and burr olive front Palladian style 8 day Comitti wall regulator with Westminster chime wall regulator with chrome plated brass grid iron pendulum and fittings. Key drawer to hide key and top break arch finished flush to the back. The case is all English Made from solid light Oak and applied with Burr Olive veneers and beautifully hand polished. The high quality Westminster chime movement plays the Westminster chime very quarter (building up the amount it plays each quarter) and then strikes the corresponding number on the hour. It uses a combination of 5 rods being struck by hammers to make the sound.